The recipe from Capt’n Kenny’s Fresh Food Truck. 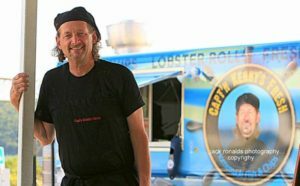 Fried Clams is one of the most requested items on Capt’n Kenny’s Fresh Food Truck. No matter what time of the season, where or when, fried clams are a feverish request on our truck every season. This recipe is the actual recipe we use on the truck along with two of our dips and a new recipe: Corn Clam Broth that Kenny just came up with. Cooked in the clam juice, the corn absorbs all the flavor from the clams and becomes a perfect side for this delicious dish that can be served as an appetizer, main entree or snacks. We paired it with one of our favorite beers from our friends at Garrison, Seaport Blonde, which is a straw-gold premium ale that has a crisp and refreshingly light all-malt body with delicate hop aromas, and a clean, dry finish. All these flavors compliment and enhance the sweet taste of the fried clams along with the corn clam broth for a superb snack or appetizer on a Sunday afternoon. This recipe is the one used on Capt'n Kenny's Fresh Food Truck along with a Corn Clam Broth and two delicious dips, one spicy and one mild. Wish all ingredients, cover, and chill before serving. - Melt butter with corn over medium heat. - Bring to a boil and let it boil for 1 minute. - Serve in a small bowl. - Pre-heat frying oil to 190 degrees C or 374 degrees F.
- In a bowl, mix flour, corn flour, salt and cayenne pepper with a whisk and set aside. 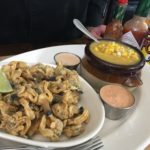 - Shuck the clams by inserting a tip of a paring or clam knife in between the clamshell, then twist the knife, slowly cutting around the seal of the clam, cutting the clam out of the bottom shell. - Soak clams in fresh water about 1/2 hour before cooking. - Strain the clams and don't discard the water. The clams leak their natural juice which can be frozen for stock or broths. if you are using buttermilk, then discard the buttermilk after soaking the clams. -Dredge the clams in the coating mix using your hands, making sure the clams are well covered. - Fry approximately 12 clams at a time for 1 minute. Do not overcook to avoid rubbery clams. - Place cooked clams on paper towel to soak up any excess oil. Optional: Sprinkle freshly ground sea salt over clams. If using frozen clams, soak them in buttermilk for approximately 1 hour. Never use a clam that is already open or broken. When using freshly shucked clams, add some black pepper to the fresh water for the clams to spit out any sand they might contain. Muchas gracias! Que bueno que te gustó! We love eating Capt’n Kenny’s food. 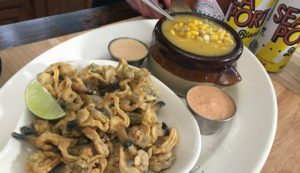 We had his fried clams one time at the Arichat store and they were to die for. We will be happy preparing them at home! Thank you Capt’n! Thank you so much for your kind words! We hope you let us know how your clams turned out!